Compiled by News Hound, Peter McDonald. 10 November 1998 A bunch of devils? 15 July 1998 Barbecued Morris Dancers? You could say it was the social event of the year. You could, but that would be a gross exaggeration. After all, it was only 23 Morris dancers and their partners enjoying the 12th Hereburgh Christmas Party. Certain ingredients were just as excellent as expected - the home cooking, the Hook Norton, the wine and the hospitality of our hosts. It was the games and the 'cabaret' that made this one different although every year is memorable for one reason or another. Sometimes we even get an audience." Who said that nothing rhymes with "accordions"? The ballet was perhaps more of a once-only experience, full of poignant moments, graceful movements, delicate steps, fishnet tights, flimsy underwear, acres of thigh - and the girls were pretty good too! Having been to Samois-sur-Seine earlier in the year, we were pleased to be asked to take part in the second part of the Twinning Ceremony when the party of 'Samoisiens' visited Harbury on October 16-18. On a bright, sunny Saturday morning, we led a procession from the School to the Village Hall and then danced briefly before the obligatory tree-planting and yet more speeches (including one from our County Councillor who hadn't the slightest idea how to pronounce 'Samois'!). We repeated our gimmick of dancing Flowers of Edinburgh to the tune of the European Hymn (but did anyone notice?). We were also pleased to see that we got quite a few mentions in the special 'gazette' prepared by the French to commemorate our visit in March. However, we were rather perturbed to see that, on each occasion, the word 'devil' was used to describe us in some way, e.g. "jolly bedevilled" and "dancing reels like devils". So, we are wondering who briefed them on Morris dancing and who was responsible for the translation from English to French, then back to English. One of the stalwarts of the side, Doug Freeman, celebrated a special birthday last weekend, with a party at Hereburgh's spiritual home, the Dog Inn. Doug has held the offices of Squire, Bagman, Social Secretary, Ale Taster and (permanently) Keeper of the Sticks and has given so much to the side over the last 11 years that it was appropriate that he should be surrounded by Morris dancers at his party. However, many other phases of Doug's life were represented by groups of other friends who were clearly impressed by Doug's dancing of 'Jockie to the Fair'. Apparently, dancing a jig at your special birthday party is now traditional so Mike joined in too because he missed out last December. If there had been more room, another six of us should have joined in! Hereburgh may not have had a team at Sidmouth this year but Lucy Grant was seen there. More specifically, Hereburgh Morris was represented in the John Gasson Solo Jig Competition by Celia and Peter with their original Harbury dance "Lucy Grant's Jig" (dance by Celia, tune by Peter). We may not have been placed in the top three but we had some encouraging feedback and thoroughly enjoyed taking part. Had there been a special prize for highest combined age of dancer and musician, I expect we would have been clear winners! Celia, Margaret and Peter enjoyed meeting up with Rampant Rooster again and helped them out with a "Vandals of Hammerwich" on the Esplanade. We always try to turn out for our local folk festival, especially when it's sunny and warm. This year, our Morris tour was great fun, mainly because of our companions, Rampant Rooster and Chiltern Hundreds. With their big team and lively band looking splendid in their green outfits, the Hundreds made a stirring sight and sound in the streets of Warwick, and their North West style contrasted well with our (Hereburgh and Roosters) Cotswold dancing. Rampant Rooster and Hereburgh quickly struck up a relationship and we enjoyed their lively approach to their dancing. Their influence was very infectious and we were soon mixing musicians with them, quickly followed by dancers. We managed double sets of Vandals of Hammerwich, Balancy Straw (Fieldtown) and even three sets for the Upton-on-Severn Stick dance with Martyn Harvey's help. We did our best to compromise on the different speeds that we each might have chosen! I think that our audiences enjoyed the sight of 'social' Morris, in contrast to the purely 'display' variety that we might otherwise have done. Our thanks to both teams for their company, music and dancing. Udøbt from Denmark is not a Morris team. They perform traditional Danish folk dances in costumes true to the period of their dances (circa 1650 - 1850). 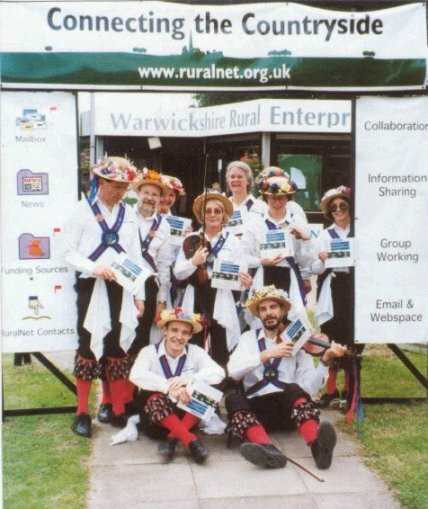 So it was a real pleasure to welcome them to our village on the eve of Warwick Folk Festival, to contrast our different dance styles and music and, of course, to socialise. Perhaps the car park of the Dog Inn is not the most picturesque corner of Harbury but it is Hereburgh's spiritual home and it provided us with the space we needed. Udøbt's dancing was very varied, from energetic high kicking to slow, stately movements with some interesting formations and figures. We loved their music too, with delicate counter-play between the accordion and clarinet and inspired double-bass playing. They even helped us out on our 'big-band' dance. 'Speed the Plough' has never sounded so good! When the air became too damp for their precious double-bass, we moved into the pub and shared a few beers, some fish and chips and a few more tunes. Please visit the Udøbt web-site to learn more about this friendly group of dancers (who all speak excellent English). We don't go every year but we've been to Ascott-under-Wychwood to dance at their fete several times during our 11 year history. It is a sort of pilgrimage because we started our first faltering Morris steps with Ascott dances in 1987 and we still do more dances from that tradition than any other. This year's fete, on July 12th, was as delightful as usual and blessed with fine weather. There were the usual stalls on the village green surrounding the horse chestnut tree with the Chipping Norton Silver Band playing on one side. When the band took its rest, Hereburgh Morris put down their Pimms and ice creams and put on an impressive display of traditional and contemporary dances, with a high proportion of Ascott dances, of course. We reminded ourselves about the Ascott Martyrs, a group of 16 women who were imprisoned in 1873 for their part in setting up the Agricultural Workers Union. Their names are inscribed on a seat which encircles the tree on the green. And, of course, an afternoon at Ascott fete would not be complete without tea and cakes in a beautiful garden, preceded by some excellent Morrells bitter at the Swan. The only disappointment was that the 'Jousting Machine' was not there for Alan to ride on! Despite the omens, we'll be going back to the Ferry. It was such a pleasant evening, the natives were friendly and the Old Hookie was wonderful! It should have been a perfect afternoon for Morris Dancing. Hordes of people strolling around the village on a sunny afternoon, enjoying a legitimate opportunity to be nosey looking around other people's gardens and taking in the spectacle of Harbury's own Morris team performing at various places. It should have been, had July not turned into November overnight. By a miracle, we never did have to dance in the rain although the wind never abated. We started dancing outside our spiritual home, the Dog Inn, where we performed the world premiere of the newest Harbury Dance, "Life in the old Dog". It was an inauspicious occasion with just one person to watch us but the dance went remarkably well, even the frantic Diagonal Dash. We moved on to dance at the opening of the new Scout Hut where we found that the 'Challenge Anneka' team had only just moved out (or so it seemed)! They had left so much mud on the old playground that we grew taller with each dance as it stuck to our shoes. After a few dances there (including our own "Windmill" and "Miller's Ghost" dances, in the shadow of the old mill itself), we were concerned that if we did any more, we might not be able to fit through the door of the pub, so we called a halt and checked out life in the old Dog again. Later on, the prospect of dancing on the wet lawn at "Bramley" (one of the open gardens) did not appeal to either the dancers or the groundsman. So we popped next door and did a few on a safe tarmac drive, including the appropriate "Country Gardens" and "Orange in Bloom". Then there was time for more of what Hereburgh excels at - eating and drinking. Cream teas, with lashings of Margaret's home-made scones and jam, were served in the garden at "Bramley" while the sun made a brief guest appearance. Watch out for more news of the adventures of the Hereburgh chums! It's not often we forget the sticks, thanks to the diligence of Doug, Keeper-of-the-sticks. However, we were caught out at the Royal Show, probably because it was one of those rare appearances early in the afternoon on a weekday. Nevertheless, our resourceful Douglas visited the Forestry stand and returned triumphantly with some pieces of wood of about the right length. Okay, so they looked more like antlers and didn't make any noise when clashed together, but they were definitely better than the only other suggestion, WREN's mouse-mats. During our stroll around the show, we turned down yet another opportunity to appear on Central TV (one has to be so careful that one doesn't suffer over-exposure on the box, ya?) but happily accepted an invitation to be recorded for the "wireless" - a BBC World Service farming programme. We just had to do "Speed the Plough". Our thanks to the Warwickshire Rural Enterprise Network and the Rural Housing Trust for their hospitality, refreshments and mouse-mats. Having destroyed the bellows on his Hohner Pokerwork at the Castel Froma Fete in June, Pete Bones was proudly showing off his renovated box in the Market Square, Warwick on July 1st. Interestingly, the new bellows are actually longer than the originals so does that mean he can now play even louder, or perhaps even longer, or both? Only time will tell.